Gosh, I'm feeling like a very neglectful blogger. My posts are stretched too far in between and then I am overwhelmed about where to begin again. This is the last day of Nicki's visit and for some reason, the easiest place to start. The farm at Stone Barns is bursting with expectation. Lambing season begins this week! The mamas are still in the barn, eating, eating, eating. The chickens are in there too. Feeling all cooped up and curious. The pigs are happy for dry, dusty fields, slightly green at the edges and their faithful farmer. In a few days everything will be different. I can't wait to go back and see April at the farm. Thank you so much to Peggy, Dede and Mary for their support of the auction for Rebecca's house in Haiti. The necklace will be on its way to Peggy! I am so happy that we have made a contribution together. My friend, Nicki is visiting and we are out and around this weekend, having fun and filling the days with local adventures and many hours of talking. Spring is emerging here, tentatively with fits and starts, but this weekend it seems to have decided to stay. I hope so. Even if it's showering, the warmth in the air and green unfolding is what we all crave. Last summer while in Michigan with the Postmark girls, I made a necklace using this image of my mom (the same one up there in the banner). I wear it frequently because it's light and easy to wear, but also because people ask about the photo and I love to say it's my mom. Over the weekend I made another one. Her face in that flower makes me think of Spring, Beauty, Innocence .... Mischief. In an effort to raise money for her ongoing housing project in Haiti, Rebecca just closed an auction on her blog. Jenny and Cynthia donated their beautiful handmade socks to the cause and many people offered donations directly to the fund. Let's keep it going and help get that house built. She is so close to her goal, and a family in Haiti desperately needs that house! Up for auction for Rebecca's house in Haiti is this necklace. I can adjust the finished length to any size or leave it around 18". To bid, please leave a comment on this post with an amount at least $1.00 higher than the last bid. The bidding will close on Friday and 100% of the funds will go directly to Haiti. These tulips have worked hard this week. Inspiration for a dinner Friday, the camera Saturday and Sunday and again on Monday. This morning they had another turn as I tried to get a project underway. Like a slow burning fire, they constantly draw me over there. I just want to sit and stare, wait for the petals to yawn a little bit more, drop dusty pollen on my table, drink more water, lean into the light. Every day since they got here, they make me so completely distracted. I stepped away and went out to the mailbox. Forget the day's project. And pretty much, the tulips, too. Still reading this lovely new issue cover to cover. My art and blogging friends are there- in my article about our well wishes project and in several others too. The April issue of Somerset Life is such a beautiful collection of art, design, photography, grace. Hoping you see it somewhere soon. It will inspire you. Ever since Mo joined the fire department, we are a family of parade junkies. St.Patrick's Day is the spring kick-off to a season of charming small town parades in the area. Grammy has never seen her granddaughter march in one and will actually have to wait until midsummer, but I couldn't miss taking her to yesterday's in Tarrytown and Sleepy Hollow. She looked cute enough to be in it and would have loved to be on the back of a top-down convertible, waving and tossing shamrocks to the crowds. Get your green on, girls! Or at least a really snazzy hat. Roughly a year ago we were walking here in Dublin. Since my photos file in date folders, it's tempting to see what was a year before now. And even a year before that. March in Dublin looks nothing like March in Cartagena or Bogota. Unless I look harder. And a lot longer. Back home after a busy weekend out and around (quick visit to Boston to see Erin and John Paul). There's so much going on that I'm hardly here at home these days and when I am, I can't find a focus for a blog topic. But right now, I'm wearing this sweater, my lucky find from Silver Bella. Some of my students remember me bragging about my $10 vintage score from Second Chance. Already it has migrated to the precious shelf, the one reserved for those sweaters I don't want to over-wear. I want it to last forever. So thanks, SD, whoever you are, for letting it go back out into the world where I found it secretly hiding, squished tightly on a vintage rack between plush coats and other fancy wraps, waiting for me. The Historical Society here in town is debuting a new exhibit on 400 years of women's clothing, all from their archives. I was invited in to take some photos of the installation in progress. Such exquisite clothing, fabrics, accessories uniquely assembled in their award-winning history center, the exhibit is beautifully done. Naturally I was totally inspired by the collection and the way the curators transformed the room into a Victorian parlor. I was surprised to see how tiny all the dresses were, way beyond petite. Can you imagine pulling that frock out of the armoire for a day out? Or in? Do you think they'd let me borrow this one for my MOB dress? Maybe I could make one.... you know, I have a few months for the embroidery and beadwork. Seriously, it's perfect. I love, love that dress. I think I'll get dressed up today. In a really fancy.... sweater and jeans. Furbelow to match. When we lived in St.Louis, the streets in the Central West End all had classic, elegant names. Maryland, Westmoreland, Pershing, Westminster, Hortense, McPherson, Euclid, Lenox. I still imagine walking up and down them, pushing a stroller, a little one running ahead. 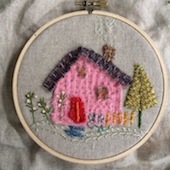 This felt cottage is named for a townhouse on Hortense Place. It can hold jewelry, necklaces and earrings. Or it can just stand alone, lovely as is. For information or purchase, please email me at clyonsweb (at) aol.com. This is another version of the class project for artFiberfest. Thanks so much for stopping by.